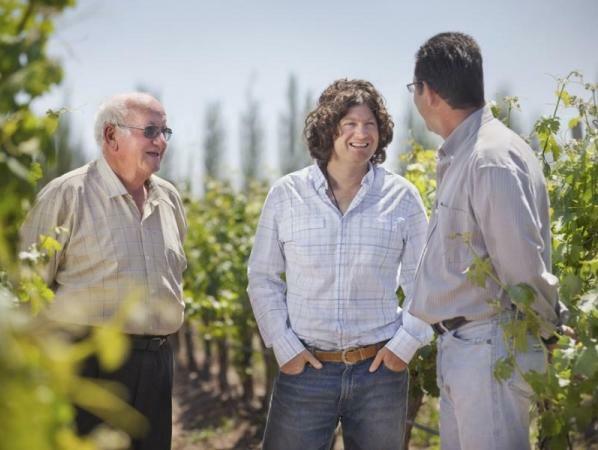 "We have tasted over a thousand wines since we began importing from Argentina. In that time, we have discovered a handful of grape growers whose results in the vineyards with specific varietals have been truly amazing--year in, year out. Our first encounter with many of these growers was at a posta del vinatero, or "tavern of the grape grower". Here they drank wine and spoke passionately for hours about their soils, their vines, and their quest for superior flavors in their grapes. We salute the hard work and skill of these growers by offering these vineyard-designated releases made solely with their special grapes. Each La Posta label illustrates a story of these individual families. One taste and you will welcome these growers into your own families, into your glass, and into your heart." James Suckling 89"A medium-bodied red with firmness and richness. Shows richness and length, but a little more on the center palate would have been even better." International Wine Cellar 90 "Bright full ruby. Aromas of dark fruits and bitter chocolate are complicated by smoky minerality and lifted by floral and spice notes. Fine-grained, generous and sweet; fuller-bodied than the Angel Paulucci offering but sound acidity gives it lovely life in the mouth. Wine Spectator 90"Ripe and polished, with lush layers of raspberry, blueberry and fig fruit that glide over alluring spice notes, with well-integrated grip. The long, creamy finish shows a floral hint that helps add length. 10,000 cases made.